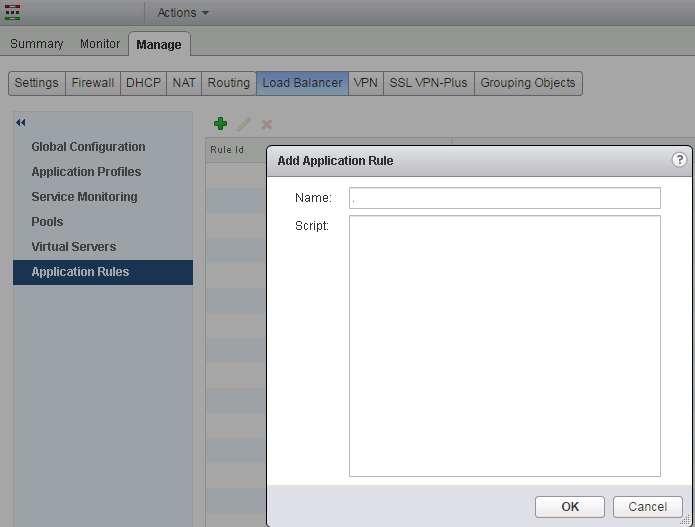 One of the advanced features of NSX for vSphere is Load Balancing. The NSX for vSphere load balancer enables network traffic to follow multiple paths to a specific destination. It distributes incoming service requests according the selected load balancing algorithm among multiple servers in such a way that the load distribution is transparent to users. The NSX load balancer provides load balancing up to Layer 7. When configuring a NSX load balancer you will need to map either an external, or public, IP address to a set of internal servers for load balancing. The load balancer accepts TCP, HTTP, or HTTPS requests on the external IP address and decides which internal server to use. You create an application profile to define the behaviour of a particular type of network traffic. You also create a server pool consisting of backend server members and associate a service monitor with the pool to manage and share the backend servers flexibly and efficiently. The service monitor, monitors health of the server pool members according to a set of defined health check parameters. VMware documentation around Application Rules is not extensive, you can find a few examples in the NSX Administration Guide. But if you need more details, most documentation will refer to the HA-proxy documentation. Although the NSX load balancer is based up on HA-proxy the ability to use HA-proxy scripting as a Application Rule is somewhat limited. Lately I found a customer use case where HTTP redirection was required and where the basic HTTP auto redirection feature proofed not to be a valid solution. The use case for me is when a customer has both vROps (vRealize Operations Manager) and LogInsight. When you integrate these two solutions you get the option to search for syslog events in LogInsight that correlate to the object, error or warning presented in vROps. Like in the example above when you click "Search for VM logs in vRealize Log Insight" the link will take you to the LogInsight web interface complete with the required filters to only show you the syslog events belonging to that particular object. To do so the link actually contains a search string or query. And good to know, the link is a HTTP link not a HTTPS link! If you run vROps and LogInsight in an Enterprise scale, you will probably have multiple instances of each solution behind a load balancer, and if this load balancer is an NSX load balancer and you use the basic auto redirection feature for the VIP(s) of LogInsight. Then clicking the link will only take you to the default home screen of the LogInsight web interface, why? The solution to keep the integration working between vROps and LogInsight while using NSX load balancers is fairly easy, you "only" need to make use of an Application Role and don't use the auto HTTP redirecting feature. If you already had a look at the VMware Application Rule scripts or the HA-proxy scripting, you might find it a bit challenging to start with. But in fact not all scripts have to be complex, for the problem discussed in this blog post the script isn't complex or long. As you can see, the solution only takes one single line (and maybe an additional line for description). This solution will do a HTTP to HTTPS redirection which will respect the entire URL.